Scroll down to view all posts, or use the drop-down menu to focus on a particular category. … a no obligation thirty minute consultation, at no charge, to discuss the potential to improve your sales performance. To take up this offer, or if you would just like to get a feel for what we might look at in order to uncover the root causes of issues impacting your revenue and profit margin, please register here and we’ll pass you on to a short questionnaire. The questionnaire is split into 2 main areas – reaching out to the customers, and selling to them. Maybe just reading the questions will help you to consolidate your existing thinking regarding your current business performance, however, if you care to fill it in and submit your answers you will get an interim response, and we will follow-up with individual feedback and the option for a no obligation thirty minute consultation, at no charge, to help you understand the issues identified and to explore options for addressing those issues. Our typical starting point for any customer project involves an evaluation of the selling capability and capacity via a thorough analysis of the current and the desired future position of the company to determine the level of maturity of its go-to-market model and the associated processes. In this way we can establish a quantifiable view of what the business in its current state can achieve and what is required to achieve the desired goals, plans and budgets. 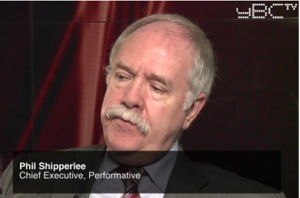 The assessment is undertaken by senior members of the Performative team, who bring a vast amount of practical sales experience to bear, consequently the process often extends to look at related issues within the business which significantly impact on sales performance. The results are typically fed back to the management team and board of directors via a presentation and workshop; they provide a blue-print for tackling the issues which are limiting the growth and development of the business. The blue-print provides a way forward which you can implement yourself, or with our assistance. Get in touch if you would like us to help you identify the actions needed to achieve your goals. The first step towards sales effectiveness is doing the right thing. This means ensuring your capabilities are honed towards a target audience that will best appreciate and hence buy from you. By fully understanding your proposition and why your customers buy from you, you can be much more focused, targeting the right audience, delivering the appropriate value proposition to meet the buyer’s needs. Workshops to uncover and refine your capabilities and marketable solutions. Customer survey activity to identify the strengths and weakness of your current offerings. Customers are likely to be more open with an independent researcher, or with a member of your senior management team with whom they do not normally communicate. ‘Secret shopping’ campaigns to identify the brickbats and bouquets of your current face to the customer. Market analysis assignments typically with the purpose of identifying and defining new markets, or trends and upcoming changes which your customers will need to address. This will help shape your approach to existing and new customers. Competitor reviews to identify and develop your winning tactics and strategies. Staffing review to leverage the talents of the team. Routes to market advice and facilitation. We’ll be happy to discuss how we can best help you engage your specific audience, so please feel free to call or email us now. Growth: providing support, advice and guidance in dealing with the many problems arising from growing a company in today’s tough business environment. Succession: If business success has been heavily reliant on your involvement, it is natural to be apprehensive when handing the reins to others so you can devote more energy to the future of the business and coaching your successors, or to freeing you for your next business. We identify the profile of your ideal recruit and shortlist appropriate candidates for your final decision. Structural Change: drawing on a wealth of practical experience to support you in the preparation and execution of strategy for; new market penetration, acquisitions, mergers, outsourcing, flotation or post-acquisition/merger harmonisation. Exit: providing expert assistance in preparing your company to make it an attractive proposition for trade sale, divestment or MBI/MBO, enabling you to focus on business as usual and retain business value. Feel free to contact us for a confidential discussion on achieving your growth plans. Click on any of the images below to access a short video presentation. Our fully managed recruitment process leaves our customers with less admin burden and more time to focus on the candidates with true potential. We have successfully used our process for sales & marketing staff and senior executive roles such as Sales, Commercial and Financial directors. On-line capability profiling can be a useful additional selection tool. Some platforms enable the creation of an “ideal” candidate profile which can then be used to compare with the individual profiles of short-listed candidates. Advising on suitable remuneration packages, targets, etc. We can also design and produce the whole package if required. Agree on the best approach to sourcing candidates such as; database search, on-line recruitment, print-media advertising and head-hunting. If the chosen route to sourcing candidates is advertising, we will design the advert and once approved by you, place it on-line or in the chosen print media. Jointly design the final selection process which gives the candidates the opportunity to demonstrate their selling capability. This will typically include a practical selling activity such as; presentation, telephone role play, selection panel or assessment centre approach. We will design the candidates’ brief for this stage to reflect the context of your business and the role into which they are to be recruited. All CVs come to us for evaluation prior to a telephone interview with relevant candidates. We will conduct face-to-face interviews with all suitable candidates and we will also explore their LinkedIn profiles where available. We create the initial short-list of candidates for your first round of interviews, providing their CVs and our interview notes and guidance on specific areas to probe during your interviews. Following your first interviews the short-list of candidates will be further refined. An agreed form of sales capability profile can be produced on all candidates in the final short-list which may permit comparison with the “ideal” profile. Final selection will be made following a process agreed in advance, as discussed above. We manage and co-ordinate the whole process on your behalf. Additional services to smooth the overall process can include; taking up references, making job offers, contributing to employment contracts and commission plans, and induction programme design and delivery. Our recruitment service, by sales for sales, is delivered for a fixed fee related to the effort and expenses required and not the typical percentage of salary-based fee. 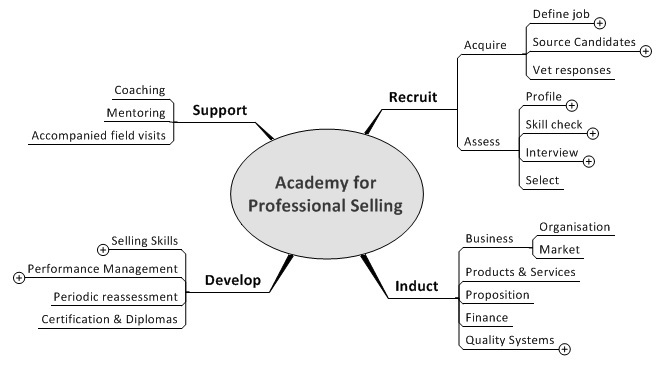 The Sales Academy provides a complete solution addressing all the people related issues associated with creating, developing and managing a successful selling operation. In designing an Academy for an individual customer, we commence with a strategy workshop with all stakeholders. That workshop starts with the basic model illustrated below. The output from the workshop tailors the Academy framework to the needs of the individual customer which then creates the specification for the individual Academy project. The Academy framework is populated with components some of which may already be in place in your organisation, others will be added by Performative to provide a complete and fully integrated solution which will have the look and feel of your organisation. A solution designed and developed by Performative but deployed by your own staff. The same solution deployed by Performative for a period of “evolutionary pilot running” before being handed over to your own staff once a settled state is achieved. The whole service can be provided as a fully outsourced service run and managed by one of Performative’s experienced programme managers. In summary, we can work with any delivery model to suit an individual customer. Contact us to see how an academy might assist you with your sales force effectiveness. Having completed an initial fact find to identify the main barriers to performance improvement we design a unique solution for each individual customer. 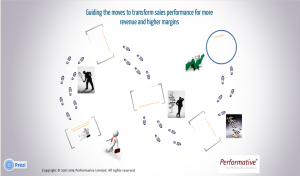 The solution is built from existing components within a framework provided by Performative Structured Selling®. This approach gives all the benefits of a bespoke solution with the efficiency of a packaged one. Market Focus Review – the Performative process that ensures the proposition, target markets and routes to market are correctly defined, fully aligned and effectively communicated at all market contact points. 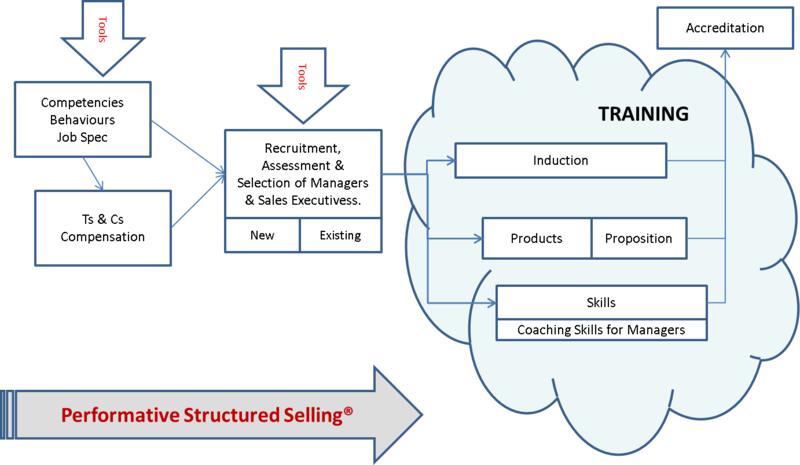 The selling model and associated processes designed for each individual customer, built around the proven Performative Structured Selling® methodology. This covers all aspects of the selling cycle and business development process, from the early stages of identifying target prospects through to full account ownership. Information and selling tools, applied correctly can empower the sales people through every stage of the selling process. All markets are getting more complex and competitive and as a result, the sales people need to be better armed, to quickly turn information into knowledge and thus maximise their chances of winning more deals, and more profitable deals. People – having now created the right environment and foundations we can turn our attention to the people. We provide a range of services covering; profiling, recruitment & selection, induction, and education & training programmes covering both process and selling skills training. Not only do we focus on the sales people and other customer facing staff, we also provide development and coaching programmes for the whole sales management hierarchy. The finished product is a fully operational, practical selling system designed to deliver sustainable performance improvement to your business. Contact us for your bespoke solution.